While searching through the natural yogurts in ASDA, this yogurt caught my attention. First I had to check it was actually yogurt as the name ‘Henna’ seemed a bit out of place in the dairy section. I’d never seen or heard of this brand before and was intrigued, even more so when I noticed the price tag of just £0.45 for the 400g pot! What a bargain. Further along I found the same yogurt but in large,1 kilogram bucket like pots with an even more tempting price of £1.00. I would have liked to take this sized pot home, but there’s no way it would ever find room in my crowded fridge, plus it had to be eaten within 3 days of opening. And, much as I love yogurt, I don’t think I’d manage to get through that amount so fast. 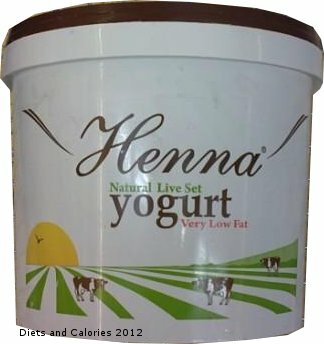 Anyway, Henna Yogurt is described as a very low fat, natural live set yogurt with no added ingredients. It has only 42 calories per 100g, or 168 for the whole 400g pot. It’s not at all sour and has such a mild taste it’s easy enough to eat without adding anything to it. It has a reasonably thick consistency when stirred and is fine to pour over fruit salad or add to cereal etc. However, I think this type of yogurt is ideal for adding to recipes, especially smoothies. 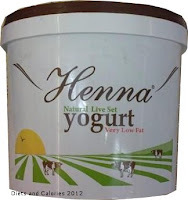 Henna yogurt is made by Pakeeza Dairies Ltd in Rochdale, Lancashire and so far I've only seen it in ASDA and Sainbury's. Incidentally, Sainsbury's sell Henna yogurt in an even more enormous 5 kilo tub! 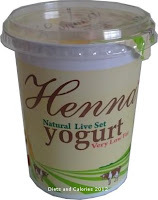 Henna Natural Live Set Yogurt is suitable for vegetarians, is gluten free and produced in a factory where no nuts are handled. Ingredients: Skimmed milk, separated milk solids and yogurt cultures. Nutrition Information per 100g: 42 calories, 3.9g protein, 6.1g carbohydrate, 3.9g sugars, 0.4g fat, 0.2g saturates, 0.6g fibre, 0.15g salt. Henna Yogurt is the rubbish yogurt ever I tried. I tried henna yogurt, it has a slightly strange taste and I found the texture unsatisfactory for eating with my breakfast muesli and fruit. Might be okay to put on your hair (I didn't try that! ), but I wouldn't buy it again to eat raw. I love it. This is my favourite yogurt. I always buy 1kg at Tescos. It is flavoursome and once stirred it does have a lovely consistency. Nothing wrong with it. Hi Stephanie, yes, live natural yogurt is fine for pregnant women. I ate plenty of it when I was! not bad,but I prefer the Lancashire farm yoghurt. but above all I love "greek style honey yoghurt".....don't suppose you have this? I bought Henna yogurt recently and now buy it all the time. Delicious with fresh fruit and very cheap. I cannot understand the negative comments! I'm so glad I tried this, was a bit dubious cos of the cheap price but it's lovely! I ALWAYS buy this now!...give it a try!